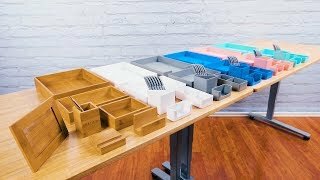 What do I get in the Desk Organizer Set? We designed the Desk Organizer Set to bring a dash of personalized style to colorless workspaces. You'll get a letter tray, medium accessory box, small accessory box, dual compartment pen holder, business card holder, and 6 gray pens with blue ink to help step up your desk style and organization with a coordinate desk set in your choice of color. What colors do I have to pick from? Bring your favorite color into your desk space in blush, aqua, white, gray, or blue color options for your desk set. Purchase a few sets to mix and match holders for an even bigger pop of color. Do any of the boxes fit together? Yes, designed to save space on your desktop, the letter tray and medium accessory box stack on top of each other. The other pieces in the set do not stack and are meant to be used separately. We designed the Desk Organizer Set to bring a dash of your favorite color to your desktop. Take your pick from white, blush, aqua, gray, or blue. Or buy a few sets to mix and match the pieces for a quirky look your coworkers will love.